Incrivel… a biblioteca demasiado boa!!! Kathy Dempsey (2002, July). 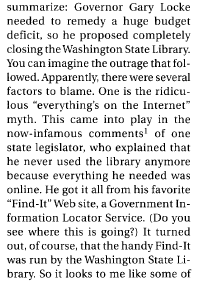 Visibility: Decloaking “the invisible librarian”. Searcher: Special Issue, 10(7), 76-81. Retrieved November 17, 2007, from ProQuest Computing database. (Document ID: 133732741).